I used a wonderful Derby Pie (Kentucky Derby!) 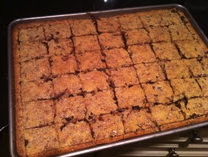 recipe and, turned it into bars. I needed a cookie type pick-up dessert for a meeting at my daughter’s school today. I doubled this recipe, and, placed two pie crusts in the bottom of a jelly roll pan. I trimmed the extra pieces (from the crust circles) to ensure the entire pan was covered in crust. Mix up the filling and, pour over the top of the crust. Bake for 20 minutes or, until lightly browned. Really good!!! Combine all ingredients and mix with fork. Bake in pie crust at 350 for 45 minutes, or until brown on top. 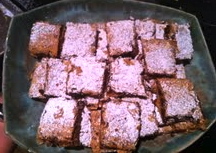 (For the bar style recipe, only need to bake for 20 minutes, or until lightly browned). Previous post: Amazing Sugar Cookies! Next post: Perfume! Perfume! Flair for Great Scents!